How to deal with defamations perpetrated through public chat rooms? I must premise that the present OP, albeit motivated by a personal experience on Mathematical Stack Exchange, aims to solicit an open discussion about an important general issue concerning the common rules for a fair behavior in formulating comments on public chat rooms here on the Stack Exchange network. For that reason, please do not focalize on the specific cases I'm referring to, but consider those just as a concrete example to better guide the discussion about the main questions. Recently I have been suspended for 7 days for a comment in which I've expressed my own opinion about the lack in correctness and honesty by one user in his/her action on MSE. That comment has been considered rude and not tolerable by MSE Moderation Team, leading to my first suspension in 5 months of experience here. Here below the message I've received on April 22 at UTC 6.18 PM from MSE Moderation Team to notify the suspension. 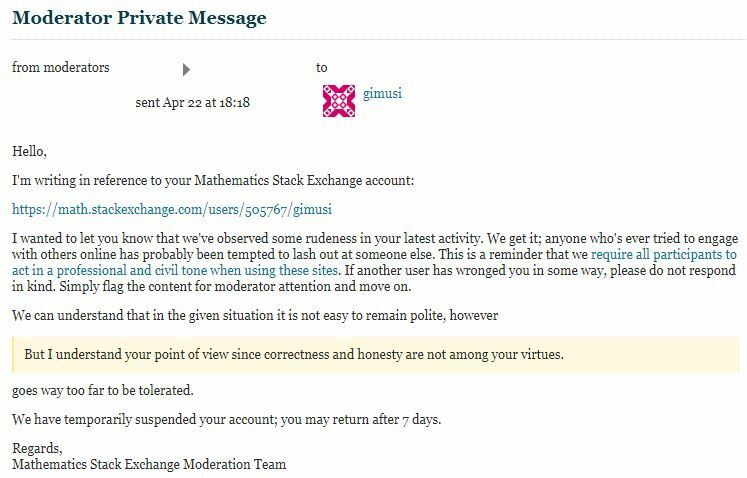 I fully respect the decision made by MSE Moderation Team, indeed my comment was of course out of place and eligible for some punitive/corrective action by the MSE Moderation Team. What I can't really understand is why the same criteria for the suspension were not applied to a deliberate defamation action against my person perpetrated by some users and posted on public chat rooms named CRUDE and Math Mods Office which, I presume, are not aimed to manipulate someone else's reputation. Why a rude but extemporaneous opinion given during an open debate by a comment can lead to a 7 days suspension while a purposeful, deliberate and reiterate public senseless accusations (i.e. defamation), perpetrated through public chat rooms, which should be aimed to different scopes, can be tolerated and allowed by the community? Is that abusive use of the chat rooms compatible with the fair harmony of the community? Am I overestimating that issue? I've formulated almost the same questions to the MSE Moderation Team after my suspension, but up to now I didn't receive any reply about that. With reference to the abusive use of chat room, I’ve received the following reply from SE support. This kind of behavior is not forbidden in a general sense, but it has resulted in problematic behavior in the past. Ultimately, it just requires keeping a close eye. Most of these groups across our network operate in a way where they only target clearly bad questions or answers, staying away from more subjective materials. If a group ever becomes abusive and starts closing clearly good questions or doing other things that become problematic to the site, the moderators can always step in and intervene. Please feel free to express your opinions and suggestions in the most open and frank way. You were not suspended for a single comment but for a pattern of behavior over an extended period of time. The comments in chat are not simply an attack on you, they raise legitimate questions based on observed facts. It is admissible, even desirable, that users that observe unusual voting patterns report them. Many cases of cheating were caught in this way. Some think it might be preferable not to raise them publicly (you can note that I suggested to inform us directly/privately), but there is also an argument to be made that it is more open (honest, if you like) to raise them publicly. Note that the comments do not only propose sock-puppets as explanation. While you can exclude that you have sock-puppets, you cannot control and know how others vote for you. In that sense, you cannot even know if the questions are without substance. But, as you said you were suspended for being rude and not for voting irregularities; indirectly, this supports your stance that you do not have sock-puppets. other user uses different machine / browser / screen size etc. then upon the allegation being made, and gimusi objecting to it, they really have a duty to gimusi to declare the existence of such evidence. I don't think it would be right to declare what that evidence is, as to do so would arm sock-puppeteers with the knowledge to be more effective, but I don't think simply to say "there is no supporting evidence" is sufficient, if in actual fact "there is some limited circumstantial evidence to the contrary". Not the answer you're looking for? Browse other questions tagged discussion etiquette moderators chat . Why are the user suspension criteria applied for unfair comments on the main site currently not applied for unfair use of public chat rooms? Should we have “messages for moderators” chatroom? Would list of chat rooms (and chat room suggestions) be useful? Why the chat rooms are created? How to get moderators' attention to an issue with some chat messages?